It’s hard to ignore the rivalries that exist in computing. Dogmatic factions stand resolute against logic, faithfully defending their torchlit companies online. Flailing argument after argument attempts in vain to derail some well-conceived post. It’s an age-old fight. Red versus blue. Intel versus AMD, Microsoft versus Apple. And no more does it exist than between Asus and MSI. More blood has been shed between these two companies than most people realize. 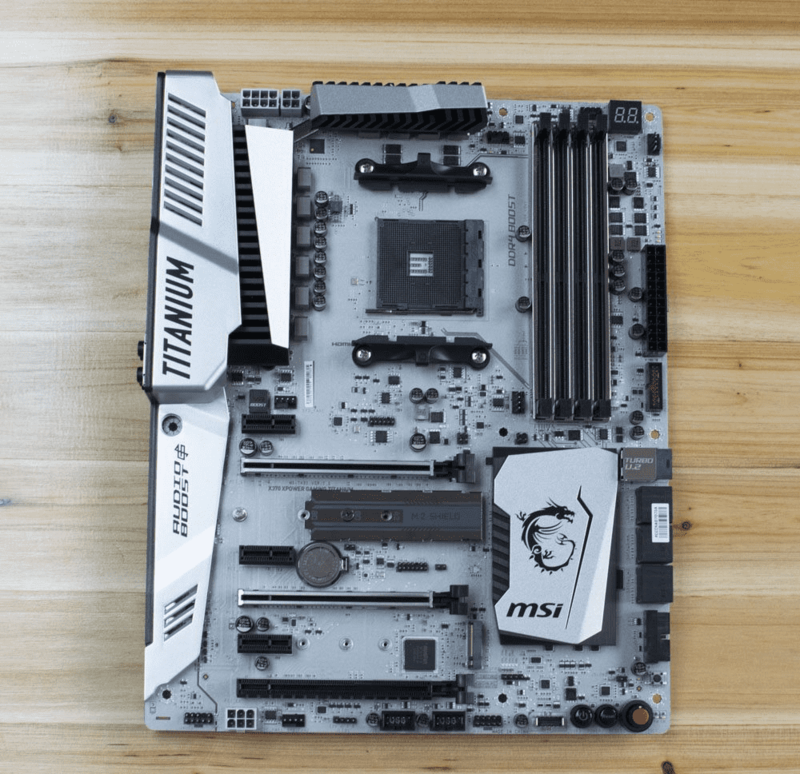 They’re the industry titans, continually goading one another to even headier heights than the last, and nowhere is this more apparent than with MSI’s X370 XPower Gaming Titanium, the pinnacle of what MSI has to muster on AMD’s new platform. The crisp silver board is a far cry from yesteryear’s budget offerings we used to recommend with AMD-specced systems. Platinum DDR and PCIe surrounds, reinforced to prevent strain on the sockets and hardware. A blackened M.2 heat shield, ready to absorb any additional heat spewed out by thermal-happy M.2 PCIe SSDs. The inclusion of Intel’s U.2 connection standard next to the bank of SATA 3 ports. All of it pushes the price and feature set of this board higher than any other our list. Admittedly, the Titanium does fall a little flatter in rear I/O support compared to the Crosshair VI Hero. With three USB 3.1 type A ports, one USB 3.1 type C. two USB 2.0, and the usual 5.1 audio and Intel Gigabit Ethernet, it doesn’t quite compete with its Pegasus-inspired counterpart. However, it’s the inclusion of two ports in particular that caught our eye: A DisplayPort 1.2 and HDMI 2.0 port are nestled next to a right-angled USB 2.0 diagnostic hub, indicating that processors with integrated graphics are on their way. Performance is what you’d expect. 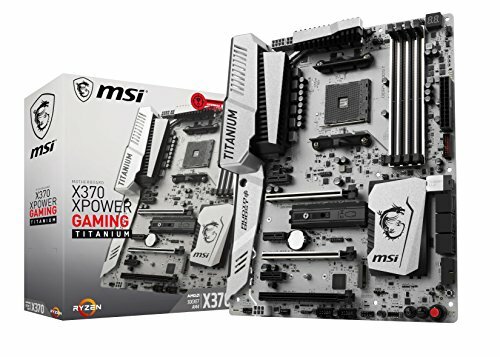 There’s very little variance between any of the motherboards here. One notable exception is the idle power draw, topping out at 61W, making it one of the highest. Additionally. X265 took a bit of a hit. compared to almost all of the other boards we tested—intriguing, because the memory was registering accurately at 2,666. 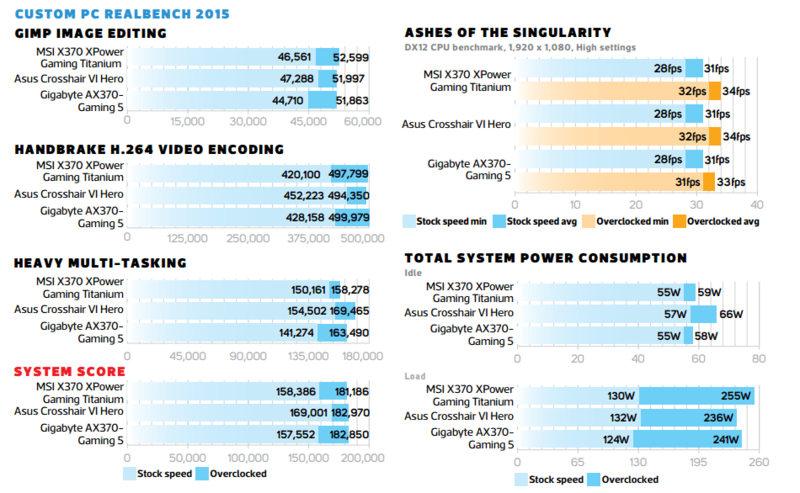 Speaking of memory, although latencies still remain higher than on the Intel platform, thanks to the new AGESA code handed out by AMD, and some succulent BIOS updates, we’ve seen higher frequency memory kits work well across most of the X370 lineup, the XPower Gaming Titanium being no exception. Matches great looks with a massive feature set and a solid EFI, although you pay a high price for the privilege. Ultimately, if you’re after a board with glitz and glam, the XPower X370 Gaming Titanium has it in spades. Stunning aesthetic; well equipped; hints at APU future; solid performance; impressive audio solution. Pricey; overclocking seems a little mute with Ryzen.